Next Wednesday, a game show featuring gifted children competing for cash will premiere on Fox. But Our Little Genius leaves some wondering whether the pressure is too much for a kid to handle. Developed by the producers of "Are You Smarter Than a 5th Grader?," the series gives children 6 to 12 a chance "to put their incredible knowledge to the test and win life-changing money for their families," according to the Fox publicity materials....The game show's questions, on topics that the child chooses, like astronomy, the Civil War or Greek mythology, increase in difficulty over 10 levels, with each level worth an amount ranging from $1,000 to $500,000. 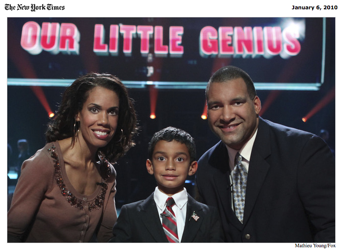 At each level, it is the parents of the contestant who decide whether to advance to the next question or to stick with the money they have already won. Once they get above $10,000, they are guaranteed at least that much. But any additional winnings will disappear if their child attempts a new question and fails. The producers of the show claim that because the decision to continue is made by the parent, the child is under no real pressure — even though the money is all riding on their answer. "The pressure is actually on the parents. The kids don't seem to ever believe they won't know something," says reality show producer Mark Burnett. Michelle Golland, a clinical psychologist and writer for momlogic.com, disagrees with Burnett's assessment, and calls Our Little Genius a recipe for a "self-esteem nosedive." "These are kids who can already have some issues relating socially," Dr. Golland said. "They are already being characterized as a genius. The pressure is on the child to answer the question. If they lose out early, what do you think that means to them?" And if a parent plays it safe, and bows out of the competition before reaching the highest prize, it could be perceived by the child as a signal that they don't believe in their abilities. The formula of the show creates a no-win situation for the kid — except, of course, if they win the entire $500,000 prize. But even if they win, the "child genius," once brought into the spotlight, faces an enormous pressure to keep up with their own achievements. The trope of the washed-up former genius has become incredibly familiar, to the point where it almost eclipses our enjoyment of the success stories. J.D. Salinger's Franny and Zooey is perhaps one of the most famous literary examples (as is A Perfect Day For A Bananafish and several of his other short stories). More recently, we have Wes Anderson's The Royal Tenenbaums, which follows a similarly disillusioned group of brilliant siblings. There was even a patient on a recent episode of House — fittingly titled "Ignorance is Bliss" — who burnt out young and wanted to spend the rest of his life numbed and dumbed down. And I haven't even touched upon the kid-actor-turned-addict narrative that we've all heard before. Although fictional, these examples represent a certain vision of youthful success and its almost necessary pitfalls. In a sense, it seems like we're expecting these children to fail — if not right now, then somewhere down the line. The backlash at Tavi Gevinson, the 13-year-old blogger and the fashion world's latest darling, further proves this point. Gifted children, when brought into the public eye, are often looked upon as ticking time bombs, meltdowns waiting to happen, or just as cruelly, dismissed as "novelties." However, anyone awful enough to hope for tears on Our Little Genius will be sorely disappointed. Fox has decided to tape several alternate endings, which show the contestants giving a good-natured "aw shucks" response to the news that they have just lost their parents a load of cash. Despite Burnett's assurances that there is no real pressure placed upon the kids, the network has still decided to create fictional endings to replace any real meltdowns. While this may be kinder to the children — who wants a public record of their messy reaction to failure? — it also glosses over the reality of their situation. They might feel an enormous pressure, and a horrible sense of disappointment, but we wont be able to judge from watching Fox's version of events.